There's a very rich vein in the realm of mutiplayer video game design that is not present in tabletop game design: our relationship to "the other." This is possible because multiple screens can give the different players separate and distinct views of the same information set. The possibility space opened up by distinct views alone is vast, but for now, I'm just going to focus on how this relates to the treatment of the other. Take my game Diamond Trust of London as an example. Two fly-by-night diamond trading companies compete over the final diamonds being exported from Angola before the advent of new international laws. One company is the titular London-based operation, while the other is the less central Antwerp, Belgium firm. The green London side is an endearing, mixed-ethnicity bunch who wear a variety of different, recognizable outfits and hop the Mediteranean sea in an old prop plane. The red Belgian side is austere by comparison, with their pale white faces, nearly identical tailored suits, and flashy Lear jets. The obvious Hollywood trope here helps you instantly recognize "the good guys." (Irony noted, given that both sides are war-fueling diamond smugglers). 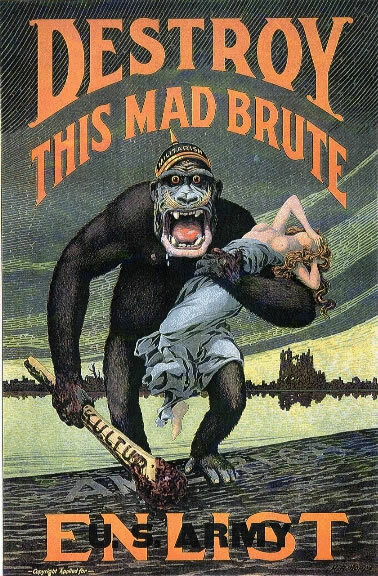 The Belgians are intentionally alienating, and they clearly represent "the other". But this seems problematic in an exclusively-two-player, symmetric game, because only one of the two players gets to experience this otherness, and it will form a slight discord for the player who is stuck playing as the other directly. Why can't both sides play London? They're looking at different screens, after all. 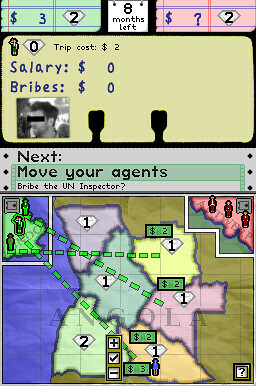 Both players can see themselves as inhabiting the left side of the map, and controlling the green London agents, and flying the prop planes. Both can likewise be presented with their opponent directing the red guys from the right side of the map. The code can handle the mirroring and the swapping invisibly. With the way this is handled in Diamond Trust, players don't even realize that it's happening. They both just assume that they are playing green while the other must be playing red. There's a deep "aha" moment waiting for them during post-game discussion, when one says, "I decided to fly my guys back to London at the last minute" and the other player says, "London? No, I was playing London. You were Antwerp." After a bit of arguing, they resort to comparing screens and scratching their heads. That's a neat trick, but what's the point? Mutiplayer video games stand in a unique position in the way that they can tackle the issue of otherness. This example from Diamond Trust is a tiny, almost inconsequential demonstration of this, because it's not a game that focuses on otherness. But imagine a game about the distinction between "freedom fighter" and "terrorist", or about the distinction between "perpetrator" and "victim." The other, as presented on the movie screen or in single player games, can often be held at arms' length as a dehumanized monster (or rather, from the modern shooter, a bandanna-faced thug). But in mutiplayer video games, you can stick the player into the role of the other without the player realizing that they inhabit that role, because other players can see the player differently from the way the player sees themself. This leaves a hard-hitting realization waiting for the player when they wonder who is controlling everyone they perceive as a brutal enemy. They become aware of how they, in turn, must be perceived by other players. The Castle Doctrine represents a culmination of my design interests in this area. Every other player in the game is just like you, down to the pixel. Yet they inhabit your world only as robotic security tape traces and through the violent damage that they leave in their wake. You never get to interact with them directly. Most importantly, you never get to see them in their non-robber clothes. In fact, you don't know anything about them, since no identifying information is given beyond a randomly chosen, 1991-government-database name that changes every time a given player dies. Thus, if you're committing a harmful act against another player in the game (and we're talking measurable, real harm of hard work lost, because of the permanent consequences of your actions), the otherness of your victim is simultaneously amplified and subverted. On one hand, your anonymity grants you real-life impunity for whatever you do, and your victim is part of a faceless mass. On the other hand, your victim might not be as far-removed from you as you think. This is a game where real life best friends can harm each other without realizing it, maybe even while sitting right next to each other. Similarly, because all players are cast into both roles as victim and perpetrator, there is a certain kind of understanding that is not present in most real world victimizations. You robbed me, and destroyed all my hard work, but then again, I just did the same thing to someone else a few hours ago. We're all in the same sinking boat here, and I can't really blame you for what you're doing. A karmic loop made visible. Going back to The Castle Doctrine's inception, first and foremost, I wanted to make a game about vulnerability and violation. I was initially inspired by my experience on Minecraft multiplayer survival servers. Much has been said about the primal satisfaction of burrowing a home in a hillside to protect yourself from the monsters of the night, but a persistent multiplayer server adds a new dimension to that psychology. The threat extends to other players, who might violate your home while you are offline. Naturally, you try to hide your home so that other players won't even find it. Upon logging back in, you venture carefully back to your secret hillside, when you're sure no other player is watching you, and then check to make sure that it has not been discovered and breached while you were away. You even check your storage boxes---Whew! All my stuff is still here. Adding to this psychological tension is the fact that stumbling uninvited into someone else's home in the game feels absolutely creepy. Again, there's something very primal being tapped here, but it's not so ancient as burrowing or climbing a tree to ward off the monsters of the night. Instead, it reminded me of modern life as a homeowner, coming home after being away for a while. First thought as you come around the corner: "Well, it's still there. I guess it didn't burn down!" No frozen pipes? No broken windows? Computer still here? When I lived in Potsdam, NY, the town culture was one of unlocked doors. I recall that some people didn't even know where their house keys were. We left our front door unlocked at all times, even when we went out of town for three weeks. Even in such a safe place, there's still a certain, nagging nervousness when returning home. I don't think I ever felt this until I owned my own home and lived there for a while. When your children have been born there and grown up there, it becomes a special and personal place. You start to care about it and almost worry about it like a beloved pet, even if it's just a fear of frayed wiring, falling tree branches, or frozen pipes. Living in New Mexico after that, where break-ins were common on our block, and many houses had bars on their windows, we were in a decidedly not-unlocked-door culture. Needless to say, the primal need to check for breaches upon returning home increases in a place like that. 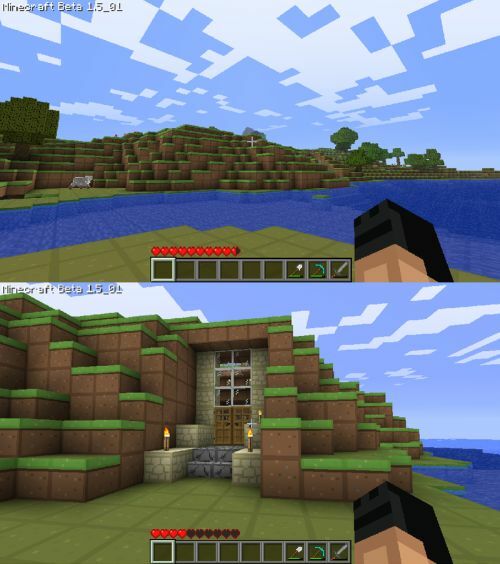 And in the midst of living there, there was Minecraft multiplayer mode. But there was something a bit unsatisfying about this aspect of the game. You could go beyond hiding your house and build fortifications or even traps, but the reality was that almost everything could be cut through and bypassed, given enough grinding, with the weakest wooden shovel. And in a virtually infinite world, everything that cannot be cut through can be dug around. It seemed like this primal desire for home protection was rich enough that it could make for a whole, concise game on its own. More so, after seeing my family violated physically and feeling the resulting helplessness, it seemed like violation was a fresh, powerful aesthetic direction for a game (in a world full of games that make you feel powerful, blah blah blah), and that I could combine the aesthetic goal of "being violated" with the primally rich home protection idea. Coming full circle, back to the issue of the other, if you're going to have a game where you feel violated, someone has to be doing the violating. Having that violation come from other players, who are also striving to protect themselves from similar violation, seemed like the perfect machine to make this happen, with the nice, empathy-generating karmic loop described above. But what about the role of the violator? That's obviously a necessary ingredient to keep the whole machine running, but it initially seems like a jarring aesthetic side-effect. Like, "Oops, you can feel powerful in this game too." But combined with the treatment of otherness, where you're not just knocking down straw dummies, but actually hurting real people who are just like you, and furthermore violating the carefully-crafted personal space of someone else, that empowerment limps with resignation. The result is a game about violation, where every victim is also a violator, and every violator a victim. It's a bizarre construction that permits the humanity of a completely anonymous, aggressive other to be brought into sharper focus than it could ever be seen in the real world.